A butane torch is nothing but a miniaturized blow torch. Yes, it is a tool derived from a metal workshop! A blow torch is a tool that can cut and weld metal together. Amazingly, if you make that tool smaller, you get the best butane torch. Just a palm-sized equipment to give out some amazing final details before serving your delicacy. I take that you are getting serious in the kitchen. It seems you want your food not just tasty, but enticing too! With this simple tool, you can make your cooking like a pro. With proper techniques, everything that comes out of your kitchen will surely be Instagram worthy! Last update on 2018-07-15 at 22:33 PST / Using Amazon API - More info Product prices and availability are accurate as of the date/time indicated and are subject to change. Any price and availability information displayed on Amazon.com at the time of purchase will apply to the purchase of this product. 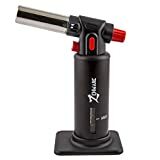 From the old fashioned industrial-sized propane powered blow torch, the art of miniaturization has managed to create a pocket sized butane powered torch. The smartest you can have is a model that can be readily placed on top of a butane can. These can easily fit in your pocket whenever you need. You can easily pack it in your bag on vacations and impress your family with eye-catching dinner. Bring life with simple desserts and give that barbecue some final touches to make even more appealing and add that grilled flavor. Some models can be plugged directly at the butane can! That’s right. No special preparation to be done. Simply plug it, and you are ready to go! Some other torches need to be refilled. It’s not hard. It's the same as refilling a lighter. At the bottom of your refillable torch is a bronze fitting where you stick the spout of your canned butane. Just simply tilt your torch and place the spout of your butane and press it. You are charging when you hear a hiss! Remember - Your butane can should be upside down. If you do this in reverse, you will only charge your torch with air. You will lose the pressure in the can, and you will not be able to extract its content! Over the years, manufacturers have customized their products to conform with the user's demands. 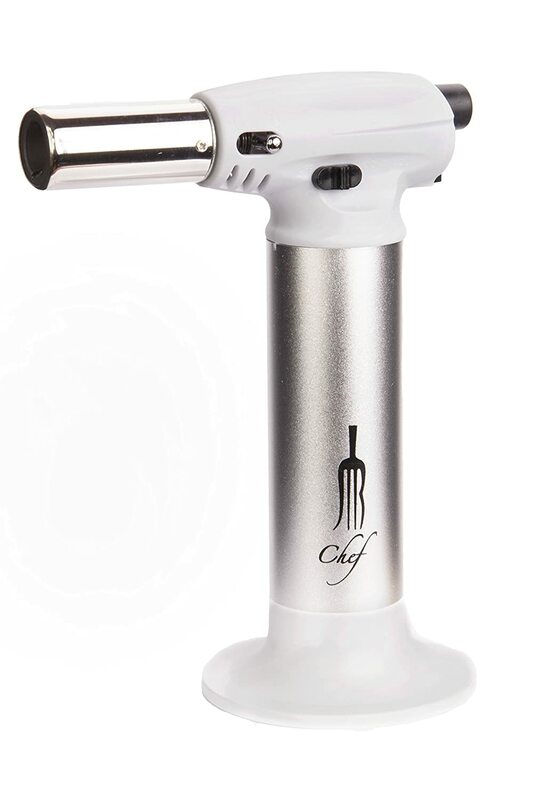 From the bulky blow torch, we now have a handy butane torch that easily fits your hands. Designs are optimized to get a firm hold and easy operation. Switches and locks are positioned properly for quick one hand operation. This will facilitate you to use your other hand to move your subject around as you torch it. How convenient is that? 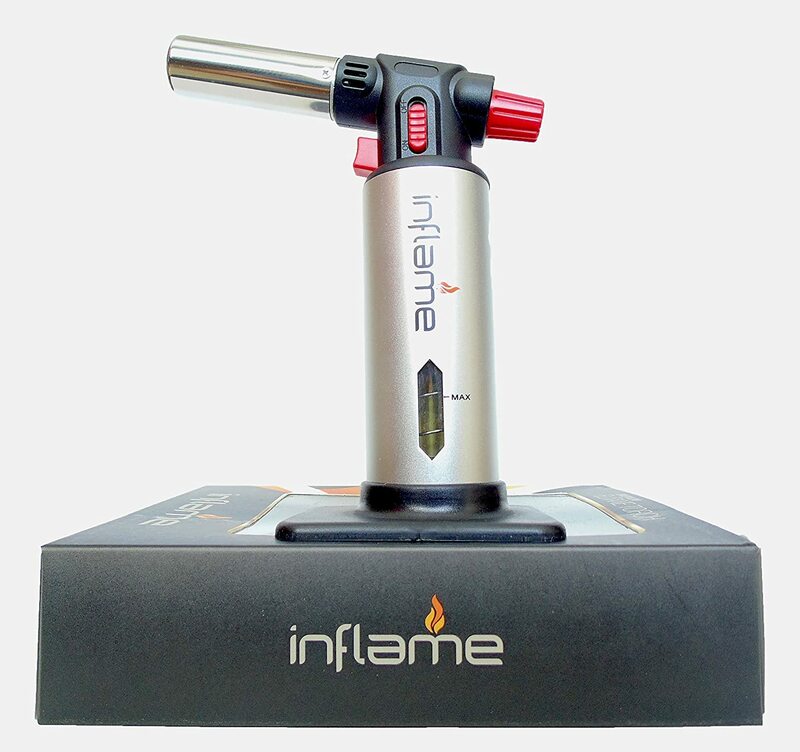 Easily adjust your butane or taper air supply for a better control of your flame. 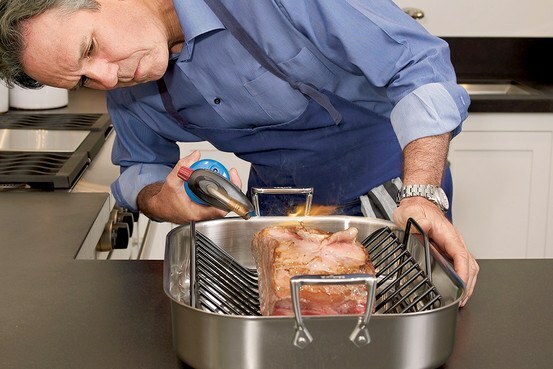 Aside from an effective culinary tool, you can also use this torch as an improvised welding tool! You can solder copper pipes or fuse electrical wires together with it! This tool is a lot of fun! With a butane torch, you can easily caramelize sugar on top of your favorite pizzelles! Some desserts might need a stove and an oven to cook. Finishing it with caramelized sugar cannot be done on your stove! This is where your butane torch comes in handy. Sprinkle c﻿﻿rushed candies on top of your cook﻿﻿ies and torch it until it’s caramelized. You can brown your icing with it for a more enticing food art! How about some smores? Torch your mallows until they melt! Sometimes your roasts tend to lack the element of yumminess when you look at it. But adding more time will overcook your meat, right? But I’m sure that it’s tasty! To make it more enticing, you can finish browning them with a butane torch. This can add a little crisp in your roast! If you are having some problem peeling your veggies, here’s something that can make that easy! Torch the skin of your veggie until it’s charred. Now when you are done, scrub the skin off, and it will easily slough off! 4. Cook Something With It! Your torch is not just for finishing touches, you know. You can cook with it too! You can easily make torched salmon out of it! Why not torch bacon wraps? Melt that cheese on top of your open-faced sandwich! Go ahead and have fun! As one of my favorites, you can roast veggies with it too! Love steak? Torches are popular tools for browning meats for a perfectly seared outside and pink inside! Torch the outside of your steak to seal the juice before putting it in the oven. 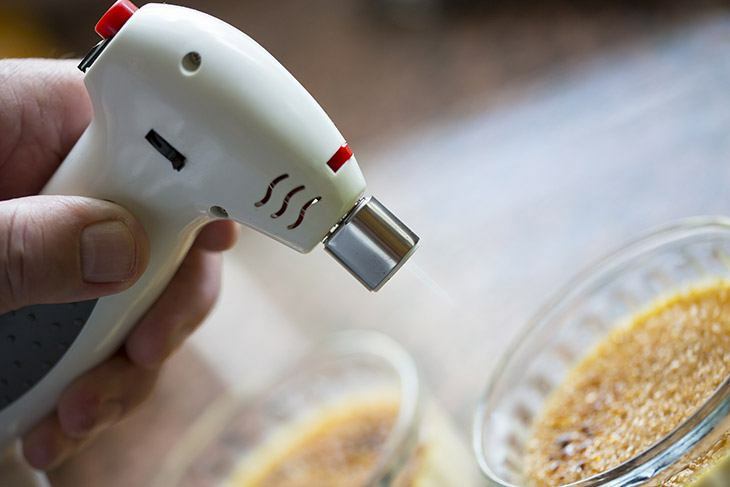 This torch made by Eurkitchen is a great kitchen tool that can help you with your Creme Brulee, torched vegan cake frosting, searing meat, or cooking seafood. It is equipped with a locking mechanism on the ignition switch so that your little ones will not be able to operate it! Lightweight - If you are doing a large batch of desserts or searing many pieces of steak and perfectly flat burger patties, you will not have to worry about straining your arms! It’s light, and you can move around with it like holding nothing! Easy refill. - Refilling this torch only takes about fifteen seconds. This means more time for the actual cooking rather than refilling! The valve can be accessed at the bottom. Stick the butane can’s spout and press to refill. Six-inch flame. - For this handy torch, a six-inch flame is remarkable. You can achieve optimal heat in just a few seconds. Well, not that you will have to need such heat every time you cook, but it’s nice to know you can max it this far. Flame guard. - Just in case you set something on fire, EurKitchen thought of protecting your hands from some injuries. They equipped this torch with a flame guard to cover your hands in case something goes out of control. Made of plastic. - Something that is made of plastic is subject to melt over prolonged exposure to high heat. It can withstand the heat while in use but not recommended for extended use. Too light. - Being too light can sometimes be a problem too. You can easily tip it off even if it has a wide base. Be careful when setting it on the table. Don’t place it on edges! Strength and durability. - Though it’s made of high-quality plastic, it’s still plastic. In time, it the quality will wear off and diminish its durability. The Zenware torch is another reliable kitchen equipment you can get your hands on. It has an angled nozzle for a more comfortable attack while you are working with it. Equipped with safety switches, you can leave it and not worry about setting things ablaze. Comes in two colors. - If you are particular about the color of your kitchen tools, this torch comes in two colors. Black and silver. I know some people take delight not just on functionality, but also the aesthetics. So feel free to select the color you want and match it with the other kitchen stuff you have. Large butane tank. - Working in the kitchen is a task already. Though it’s enjoyable, a simple feature that eliminates frequent refilling of your butane torch can make you more efficient! A single refill of Zenware’s torch is for a straight three-hour usage! This means you don’t have to worry too much about refilling your gear. Three-year warranty. - Zenware is confident that their product would last at least for three years! During this three-year period, you are entitled to a company warranty. They will be entertaining all troubles you may face in using their product! (Of course, as long as any damage is not the result of negligence). Affordable. - Nothing much to say but it’s not all that expensive. Trouble refilling. - It’s not always hard to refill this torch. But there are times that it takes more time than what is specified on the packaging. There are times that there seems to be a leak no matter how careful you do it. The handle is a little slippery. - It can be a little slippery especially if you have sweaty hands. A little knurling on the grip can give you a safer feel. This is something a rubber band can solve. Tie a few rubber bands to make a stronger grip. 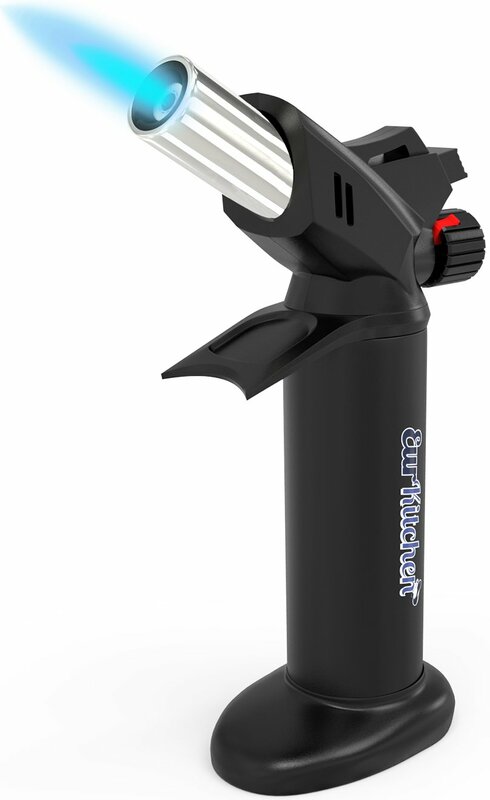 The design of this mid-range butane torch well thought of. The anodized aluminum body is sleek and stylish by itself already. It’s accented with red colored switches which visually teaches you its functions even without the manual. The nozzle is angled for easy and more natural position when working. Anodized aluminum body. - This torch is made of a sturdy material you can trust. You know it’s strong as you hold it. It has a good grip and would not slip out of your hands easily. Ceramic nozzle tip. - Inside the stainless nozzle is a cylindrical piece of fire-resistant ceramic piece. This is an effective material that can last you years! Inflame made sure that you get what you pay for! Ninety-day money back or product replacement! - Inflame is also confident with their product and places customer satisfaction their top priority. Ninety days is a reasonable time-frame to check for factory defects and other anomalies. They would be willing to refund your money if you don’t like it or replace your unit if found defective. Small butane tank.- Make sure you have a can of butane on stand-by in case you run out of fuel. The tank is a bit small for its size. You only get 35 minutes of light for every single refill. 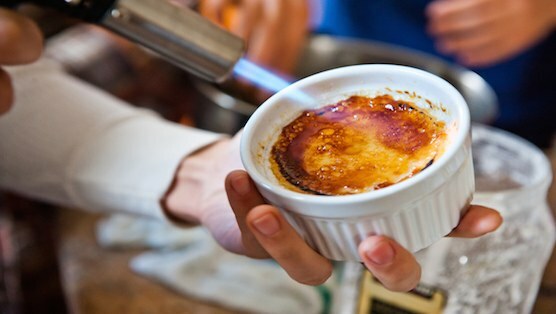 If you are cooking insane batches of Creme Brulee, make sure you have a spare can of butane ready. Flimsy ignition switch. - For this price range, you would expect good quality already. The moving parts are a little flimsy but work fine. If you are a heavy user, you might not be satisfied. For casual users, this is perfectly fine. This silver right angled torch with white joining parts is in the mid-rage value. Etched on the lower portion of the cylinder is the logo of JB Chef branding. The operation is fairly simple and straightforward. A safety locking feature gives your ignition button and added safety feature. You will have to reset the ignition every time you light it. Lifetime warranty. - One of the best things you can have is a lifetime warranty on every product you buy! As long as you are alive, and as long as the company exists, you will have a guarantee! You can hand this item over to the next generation if you must! Sturdy base. - It easily latches on its base whenever not in use. Easy one hand operation. - The moment you need that light back, you can easily operate and ignite it with one hand. No hassle. Reach for it, click ignite, and go back to lighting things in the kitchen! Durable and reliable. - This can be a little expensive for some, but that cost is reciprocated with quality. This feels though and sturdy to hold. Merely holding it speaks about its excellent craftsmanship. It comes in white. - There is nothing with white. But hey, you are working in the kitchen, or wherever you intend to use it. It will be subject to harsh environment exposure. White easily gets dirty and grimy. Anyhow, you can wipe them off with a damp cloth to clean. No tank window. - If you don’t have a can of butane refill at home, you may find yourself anxious if you will run of fuel. A tank window or a gauge could have easily solved this problem. 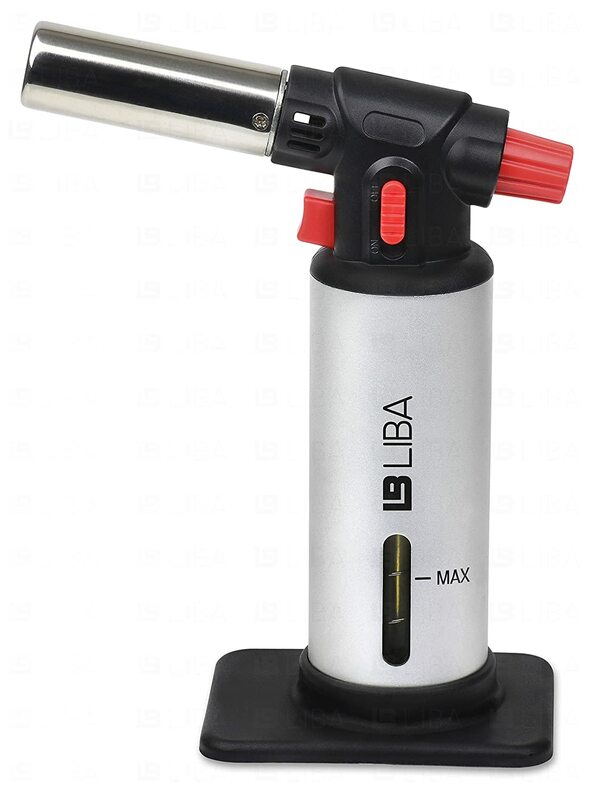 This torch made by Liba is a great kitchen tool with a stainless nozzle. Printed on the center of the cylindrical silver metal body is their logo. A tank window can be seen just below their logo. This can tell you how much butane you still have. The nozzle is ergonomically angled for easy usage. Switches are accessible and can be easily operated. Professional quality. - In this price range, you get the top-notch quality. They can be expensive, but they can be worth the price. They are extremely durable, handy, and reliable. Three-year warranty and ninety-day money back or replacement guarantee! - A ninety-day guarantee is a reasonable time frame to check for factory defects. This company is willing to return or replace this torch in case you face some trouble. Tank gauge. - You can always anticipate when you need to refill your tank so that on your next trip to the grocery, you can grab a butane. Gas hungry. - You may need to refill this frequently. Especially if you are using it on its highest setting most of the time. Nothing but a spare can of butane cure. Poor base design. - Careful when you are watching it on its base. Just a friendly reminder, keep it far from the ledge as the base is a little unreliable. You might knock it off! Butane torches are a great tool you should have in the kitchen. You can always make your dish one notch better with a few tricks! 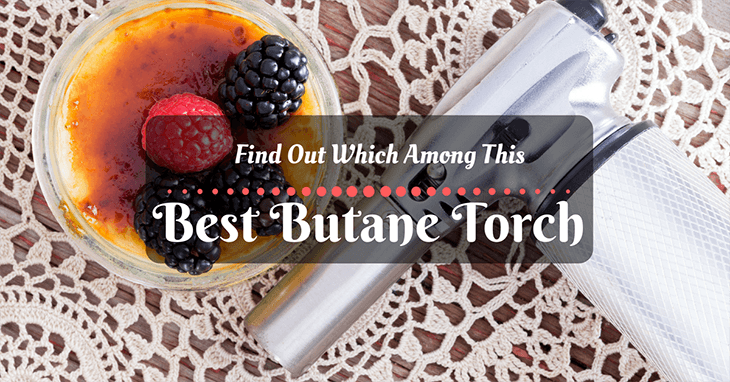 Getting the best butane torch is not easy. So, you should put some thought when buying as they are not all made the same! Clearly, in this roundup, Liba had the upper hand among the rest. But if you are a little tight on the budget, Zenware’s torch can do the same thing! Did this article help you decide? Share your thoughts bellow and don’t hesitate to share this page with your friends!